Google Notebook added the most requested feature: labels. Now you can label each note and see all the notes that have a certain label. The application imports all the labels and web pages from Google Bookmarks and places them in a new notebook titled "Unfiled". Adding a new note in this special notebook actually creates a new bookmark. The organization of a notebook is more flexible: the notes can be sorted by date, by label and filtered by label. Google Notebook's extension was also updated and has a new option: select the text from a web page and click on the small star to add it as a note. Now you can use the extension to add bookmarks by clicking on the star when the "Unfiled" notebook is selected. All in all, the integration between Google Bookmarks and Google Notebook is interesting, but it's not very transparent in the interface. 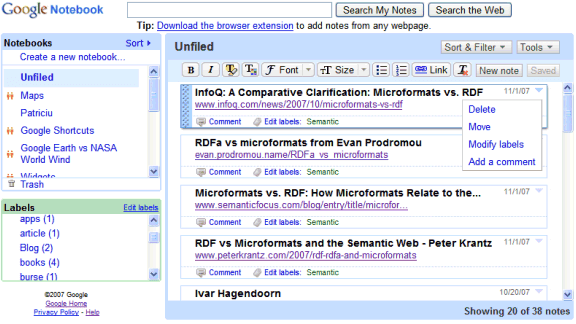 Every bookmark becomes a note in a special notebook, but "Unfiled" should be replaced with "Bookmarks". Google Notebook will also add offline support using Google Gears in the near future, so you can access your notes and bookmarks even when you don't have an Internet connection. Anyway, just my request, and thanks for the new additions. when will they connect the shared stuff page with bookmarks and notebook? Any ideas? It seems only natural to connect that social function possibility as well. I've made a lot of use of Notebook in the past, less recently as I've been using the combo of Blogger and Reader to keep track of the relationship between what I just want to link to vs what I want to comment on or write about. Notebook though certainly has the potential to become the all-in-one interface to everything. It seems under-advertised to me. Now just what has happened to those Gmail updates you mentioned the other day. I'd love to finally clean up my contacts list in Google, but the old interface is almost useless. I wonder if they hit a snag with early users, as I had read some comments that some people were finding it slower rather than faster. Fantastic improvement. This is a taste of future integration. Where could this lead us? 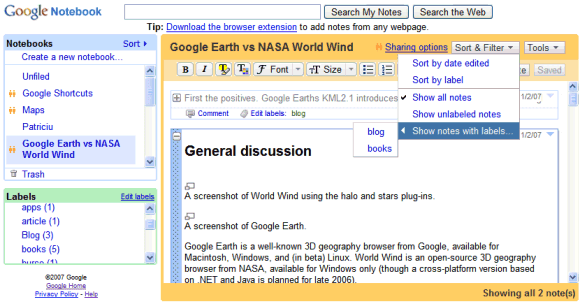 Envision a Google-enhanced web where you can browse safely, cherry-pick the information, bookmark at the flick of a finger, effortlessly tag, and where you can then pack your snippets in notebooks, structure them, add references, add images etc., and where you can then review , collaborate, integrate with xls, kml, skp, etc., and where in the end you can publish, republish, generate flyers, export as google docs etc... Welcome addition, Google. What next? Add outlining features to notebooks! Well, this looks to make Notebook even more useful, however, now when I go into any of my notebooks that isn't one of my old bookmark "labels" I get a never-ending refresh state in Firefox--throbber keeps throbbing & progress bar keeps progressing (not very pretty and really quite annoying). Such is the glitchiness of new features, I guess. 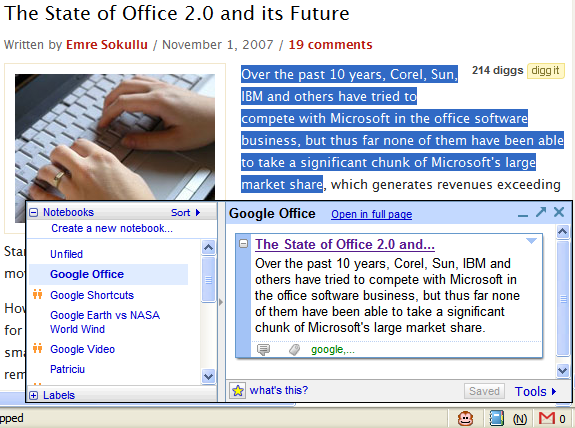 I like this integration between Google Bookmarks and Google Notebook. And I hope it will become more "social" in the near future too. But I have to say that the interface is a little bit chaotic. What should I do with items under Unfiled? Should I reorganize/modify them? I think this is great. Just hoping to see Safari support at some point, along with Google Docs. Thanks for the great work. Concept of labels need to be extended to all the google applications. google should have googlelabels as a separate application, wherein each person maintains a list of his/her list of labels. Then these labels can be used by him/her in any of the google applications. So common label are assigned to all the applications. In googlelabel we can directly access a label and jump to specific label of specific application. That would be kind of indexation of all content hosted by on google. I also noticed that Google Notebook shows the labels from Shared Stuff and the correct number of items, but it doesn't display the links from Shared Stuff. That means we'll probably see a triple integration: Bookmarks - Shared Stuff - Notebook. That's an interesting idea, but I'm not sure that labels server the same purpose in all Google's applications. The labels you choose in Gmail, Reader, Docs, Notebook could have a different meaning depending on the context. Maybe Newsletters in Gmail means "newsletters I subsribed to", while in Google Docs the same label means "newsletters for my company". Another step towards perfection... But I must say what's glaringly missing from Google notebook is the ability to do wild-card searches or search within text strings of my notebook entries. This feature would be killer! all my labels disappeared wtf??????? Bookmarks has gone and all labels of notes disappeared. What's happened? I think the glitch was fixed, right? Is there a way to *not have bookmarks imported to Google notebook? Opt out, switch it off, etc? No, but you can ignore the Unfiled notebook. I'm very disappointed that there is no way to turn off bookmarks. I also do not want my bookmarks in Notebook. I was excited to see that labels had been added until I found out they are linked to my bookmarks and that if I modify the labels in Notebook it will modify the ones in bookmarks. That basically makes it useless for me. Please either enable us to turn off bookmarks or at the least exclude them from labels. If not then I will be better off storing my stuff the way I did it before Notebook. I enjoy using most of Google's apps and I do like the new look but I'd rather have the old Notebook back if I'm stuck with Bookmarks. Someone asked a Google product manager to use the same labels in all Google services and to create a unified view that shows all the items that have a label (messages, blog posts from Reader, bookmarks, documents etc). He said it's an interesting idea. has to be the understatement of the year. I worry for Google if any of the technical people there from programmers all the way up to the top can't see the need to standardize both the terminology as well as the "methods", APIs, and so on within the "Google stack". Now with development happening on so many things at once (I would hope) you can't get complete consistency all the time. But don't they have ANYONE there who serves as a high-level designer who could at least steer the various Google products in the same general direction, looking for synergies, code re-use, etc? Even Microsoft "gets-it" better than this. What am I missing? only you have commented to be "an interesting idea"
I made the mistake of refiling the bookmarks from the "Unfiled" notebook into a new notebook that i logically named "Bookmarks". MISTAKE! My bookmarks no longer appear in my heavily used Google Bookmarks. Anyone have an answer on how to get them back into my Google Bookmarks? Wow! This is a major bug. If a move a bookmark to another notebook, it disappears from your list of bookmarks and there's no way to put it back. Google Notebook did a poor job at explaining the integration with Google Bookmarks. Both Bookmarks and Notebook are great, but the integration is AWFUL. To keep bookmarks properly listed, they must be in the "Unfiled" Notebook section. It will be nice to have gears integration. On the train is where i do most of my reading. I have to take notes in textmate, and then rewrite them into google notebook once i have internet access..
its weird that im logged into gmail but i somehow have to log into blogger seporatly? whatever. I love Google Notebook! I'm a PhD student, and I use Google notebook for my notes and stuff so that I can access it everywhere. I wish there was an OFFLINE version of it though, so that I can use it even though I have no internet access. It really needs both SSL and off-line support in order to be a real alternative to desktop applications. Why cant I rename the Unfiled bookmarks where my bookmarks are added and create personalised ones? If my bookmarks are filed into the categories I made for them, then why are thy still call unfiled bookmarks by google notebook? If it's just a way to list them all together, then just call them bookmarks, plain and simple. They are not unfiled. The ones not in my categories are the umfiled ones--not the whole list of them. Until I figured this out, it was confusing and frustrating thinking that google didn't recognize my catgories, even though they are listed on the bottom left of the modify screen. Has the Gears facility died the death? I just hope the offline support will allow you to create new notes and edit notes. I use google notebook to organize my thoughts and ideas for writing, I like it much better than google docs for this purpose.